Background: Age has a significant impact on activities of hepatic metabolizing enzymes in humans and animals. Flavin-containing Monooxygenase (FMO) and Aldehyde Oxidase (AO) are two important hepatic enzymes. Understanding of the impact of age on these two enzymes is still limited in pigs. Objective: The aim of this work was to assess hepatic FMO and AO activities of male domestic pigs at five different ages of 1 day, 2, 5, 10 and 20 weeks. Methods: Porcine liver microsomes and cytosol were prepared from the livers of male domestic pigs at ages of 1 day, 2, 5, 10 and 20 weeks. FMO activity was assessed using N-oxidation of benzydamine in porcine liver microsomes and AO activity was evaluated using oxidation of O6-benzylguanine in the porcine liver cytosol. Results: Porcine hepatic FMO activity was substantial at the age of 1 day, rapidly increased in 2 weeks, and remained high afterwards. 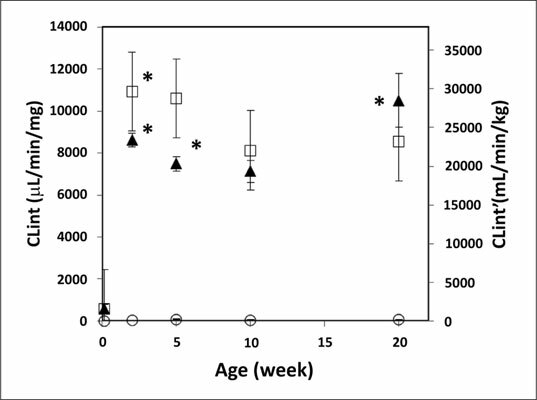 Porcine hepatic AO activity was minimal at the age of 1 day and gradually increased to the maximum in 5 weeks and remained relatively constant to the age of 20 weeks. Porcine hepatic FMO activity is higher than other species, including humans. Age-dependent FMO developmental pattern in porcine liver is different from porcine hepatic CYP450 and human hepatic FMO. Porcine hepatic AO activity is much lower than humans although their developmental patterns are similar. Conclusion: Age impact on hepatic activities of both FMO and AO is obvious in domestic male pigs although age patterns of both enzymes are different. Flavin-containing monooxygenase, aldehyde oxidase, pig, liver microsomes, liver cytosol, age.